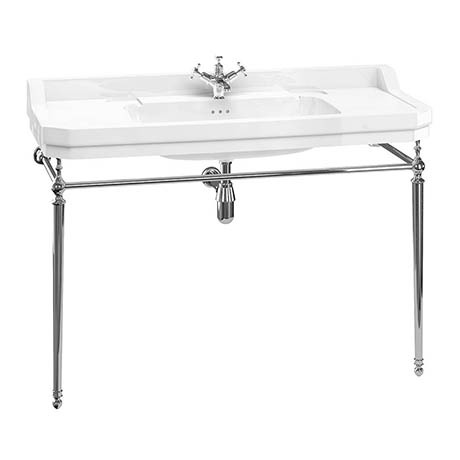 With structured corners and an angled design, the Burlington Edwardian 120cm basin and Chrome Wash Stand is the perfect centre piece for any bathroom. The elegant chrome plated wash stand comes with brass fittings and adds to the classic and timeless look. This basin is available in a choice of 1, 2 or 3 tap holes, this option opens you up to be able to choose from the entire range of Burlington's stunning and elegant taps. Please note: Tap and waste not included. The integral overflow is to solve the issue of a dripping tap if the plug is left in. It is not designed to take a flowing tap.